It was just another working shift for Motor Officers Kronschnabel and La Niece as they proceeded to the intersection of 23rd and Main Streets. This particular intersection had been established as a problem, with violators driving on 23rd Street colliding with vehicles on Main Street. The officers had just gotten into position on Main Street, when they observed a vehicle westbound on 23rd Street cut the corner and proceed southbound on Main. Officer Kronschnabel told his partner to remain at his location while he cited the violator. After the suspectâ€™s vehicle turned westbound on 24th Street, Officer Kronschnabel pulled along side and began to tell the driver to pull over. As the vehicle slowed to a stop, the driver leaned out of the window and fired one shot, striking Officer Kronschnabel. He fell from his motorcycle into the street while the suspectâ€™s vehicle drove away. Officer Kronschnabel, assigned to the special “speed detail,” died of a single gunshot wound. The assailant at the time was unknown, but the subsequent investigation revealed the following events that lead up to the shooting. On the evening of December 16, 1916 Loma Allred, age 13, was walking home from the corner store, when she saw a gas jitney pull to the curb. A man got out with a gun in his hand and after tying and blindfolding her, forced her into the vehicle. Once she was inside the vehicle it drove away and had traveled just a short distance when she heard another vehicle draw alongside. A few seconds later, she heard a shot. After the shot the vehicle started up and proceeded to Vernon and Van Ness Avenues, where the suspects loosened her binds and put her out of the car. One of the suspects gave her a dime for carfare, and as they drove away, she was able to see the license number. Shortly thereafter, she boarded the Vernon Avenue streetcar and told the conductor what had happened to her. He notified the officers at University Station (now Southwest Division). Officer La Niece told investigators that he and Kronschnabel had been at the intersection of 23rd Street and Main for only a short time when a gas jitney turned south on Main from 23rd. The driver of the jitney was driving like he was drunk. Kronschnabel told him to wait there for other violators and he would “take care of this one.” He observed his partner follow the jitney as it turned west on 24th Street. He then heard what he thought was a car backfiring and thought it was the suspectâ€™s vehicle when it stopped. (Cars of this period had a spark advance on the steering column and would backfire when the driver let up on the gas pedal.) Officer La Niece was unaware of the tragic events until the police ambulance drove past him and turned onto 24th Street. With curious apprehension, he followed and arrived just in time to see them loading his partner into the ambulance. Officer La Niece told investigators that the suspectâ€™s vehicle was a dark-colored, seven-passenger model with the top up and it had side curtains. He was unable to see how many people were in the car but thought that only the front seat was occupied and that the car was either a Studebaker or an Overland. The investigators, according to newspaper articles, were Chief of Police Butler and Detective Lieutenant Home. They were informed that the conductor of the Vernon Avenue streetcar had placed the original call to the University Police Station. This person had also supplied the police with the license number 185229, that had been given to him by a 13 year old girl named Loma Allred. This information regarding the suspectâ€™s vehicle was put out over the “game well system” as well as in person to all officers. (There were no police radios at this time). The investigators speculated that the suspects responsible could very well be one of a gang of men infesting jitney busses throughout the city; kidnapping and robbing young women. Investigators interviewed the Allred girl and were able to obtain additional information. According to the victim, the suspects took her groceries and the gun used in the shooting and proceeded to bury them at different locations. She was able to take the officers to the locations where these items were recovered. Investigators were notified that Patrolman Ackley, in a borrowed car, had stopped the vehicle bearing license number 185229 at Thirty-sixth Street and Main and arrested five occupants. The suspects were transported to police headquarters and gave their names as James Hawthorne, who was believed to be on parole for burglary, Dewey Captan, James B. Edward, Gray Minzer and Ed Brown. The vehicle used in the kidnapping was determined to have been rented by one of the suspects. Investigators were able to trace the found weapon through pawnshop tickets to a Walter Anderson, who was located working as a switchyard brakeman. He admitted loaning the gun to a James Burchill, who had escaped from the vehicle used in the kidnapping and fled to Mexico. Assistance from detectives in the San Francisco Police Department resulted in obtaining additional information, as well as photos of the suspect, also known as James Darwin. This information led investigators to the wife of Burchill who told them about several tattoos on his arm with the names, Madeline, Hazel, and Anna. This information would later prove instrumental in helping investigators identify Burchill. 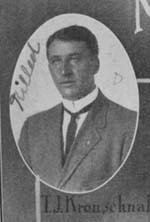 It was almost three years later, in 1918, that LAPD detectives received information that James Burchill had been arrested in Pittsburgh, Pennsylvania under the alias, James Melley. He was in custody for the shooting death of Edward R. Pry. His arrest and identification resulted in a legal battle to have him brought back to Los Angeles for trial. The authorities in Pittsburgh questioned Burchill and they were able to obtain a confession from him in the killing of Officer Kronschnabel. Burchill was convicted on May 5, 1919 for the murder of Edward Pry and sentenced to serve 20 years in prison. The authorities in Los Angeles vowed to be waiting at the prison gates to serve papers on Burchill the day he was released. Twenty years later, on May 6, 1939 James Burchill (a.k.a. James Melley, and James Darwin), identified as being responsible for the death of Officer Kronschnabel, walked out of Western Penitentiary in Pittsburgh, Pennsylvania, a “free man,” or so he thought. As he walked from the prisonâ€™s front gate, Detective Lieutenant Emmet E. Jones of the Los Angeles Police Departmentâ€™s Homicide Bureau was there to greet him. As Burchill was enjoying his first thirty seconds of freedom, Detective Jones promptly snapped a pair of handcuffs on him as they met. Twenty-three years after the senseless shooting death of Officer Kronschnabel, the LAPD finally had his killer. Burchill was returned to Los Angeles to stand trial for Officer Kronschnabelâ€™s murder. On July 20, 1939 a jury found Burchill guilty of murder. The District Attorney, U.U. Blalock asked for the death penalty, but Burchill was instead, sentenced to life in prison. Officer Thomas D. Kronschnabel was born on December 22, 1879 in Benton, Minnesota. He migrated West and joined the Los Angeles Police Department on November 2, 1904. Eight years later, Kronschnabel passed the exam for the “speed squad,” as a motor officer. Officer Kronschnabel was 37 years of age and a 12-year veteran of the LAPD at the time of his death. His wife and a baby daughter survived him. Officer Kronschnabel represents the proud traditions of the Los Angeles Police Department, which survive today in each and every officer of the Department. Officers such as Thomas Kronschnabel should never be forgotten after making the ultimate sacrifice for the citizens of Los Angeles.